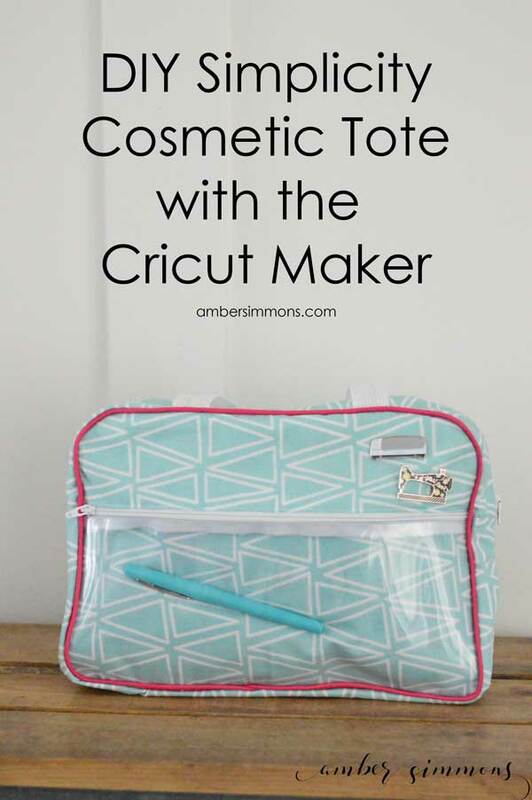 A step-by-step tutorial on how to make a DIY Simplicity Cosmetic Tote with the Cricut Maker. Hi everyone. Today I’m going to be sharing a really fun project. 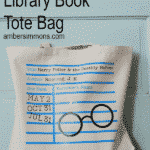 This is a cosmetic tote bag, but you could really use it for anything. 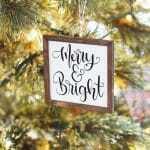 It’s a Simplicity pattern that you can cut with your Cricut Maker. Which makes it super easy. 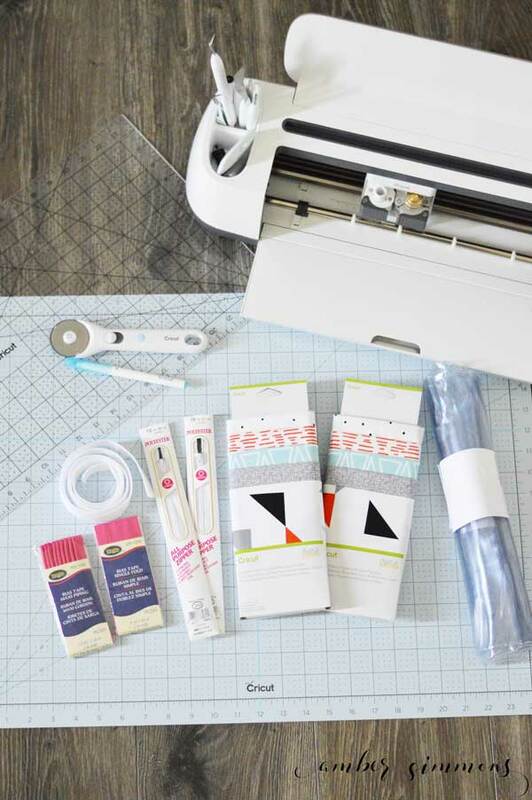 Did you know when you use your Cricut Maker for sewing patterns it not only cuts out the pattern, it also cuts any notches, and will number your pieces as well as mark any dots that you will need to match up later? 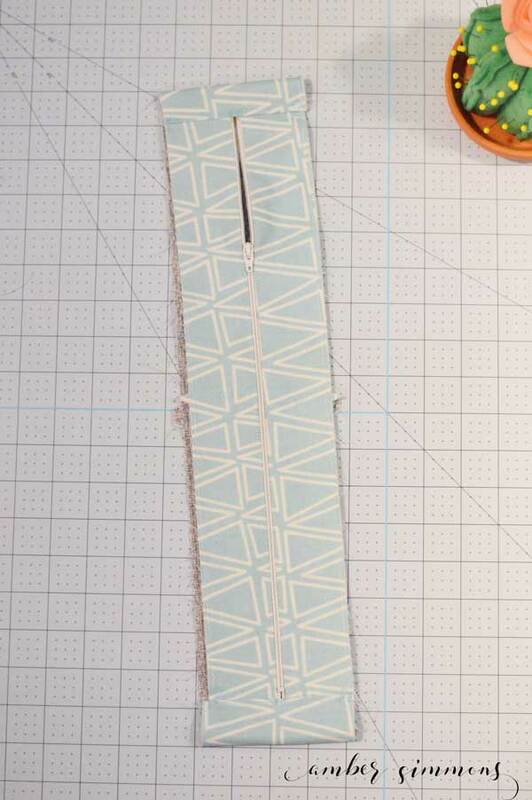 If you have ever hand cut a pattern you know what a big deal this is. It’s so great. 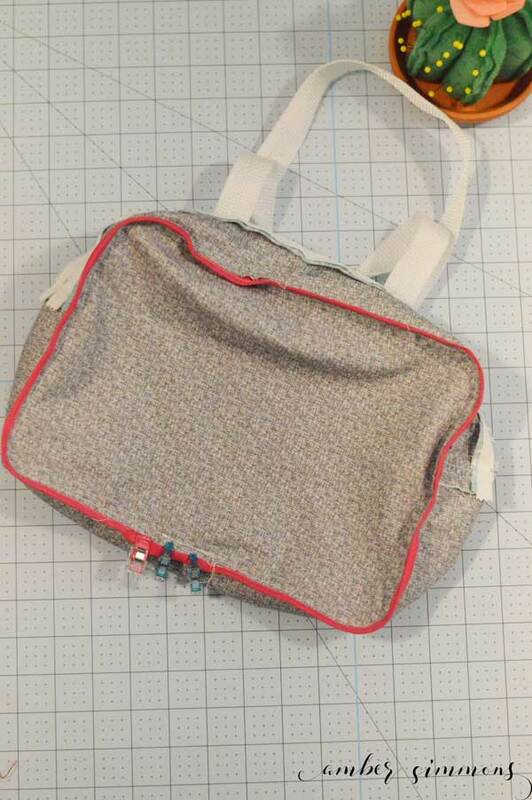 The pattern I used is the Simplicity Cosmetic Tote. 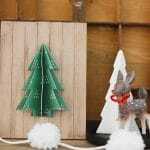 On all the Simplicity patterns you will find the list of supplies, as well as cutting instructions, and a PDF of pattern assembly. 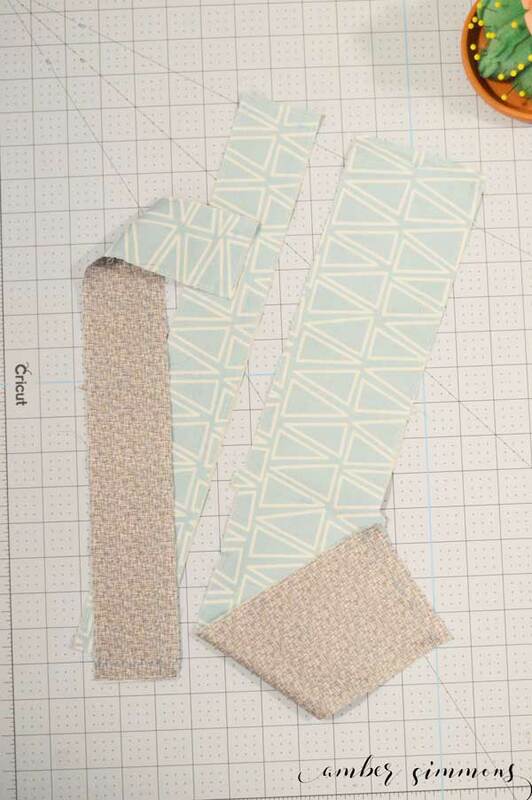 For this pattern, I used Cricut fabric from the Riley Blake Creative Rockstar line. If you look at the instruction page of the pattern it tells you what materials go on which mat as well as how big of a piece you will need. Mat one is the vinyl. Place your piece of vinyl on the mat. I used the Brayer to get a nice bubble-free seal to the mat. It did make it a bit tricky to pull off, but I think it worked great. 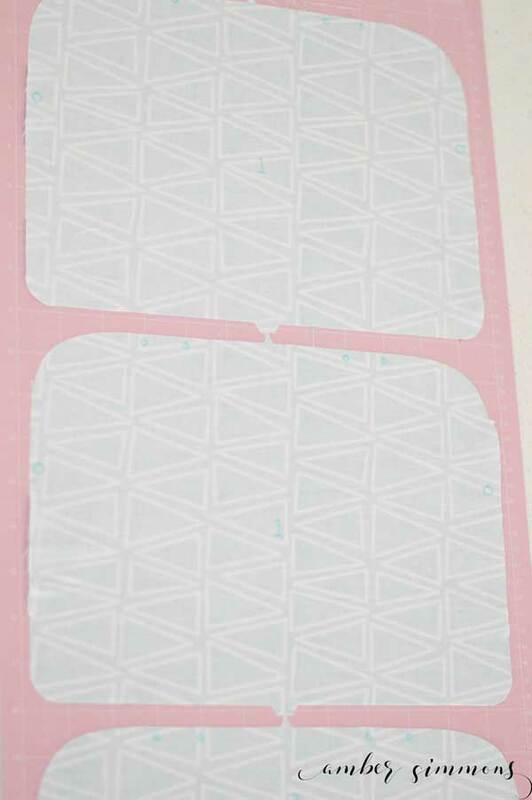 Put the mat into the Cricut, choose the heavy fabric cut option and press the cut button. Mats 2 and 3 are your exterior fabric. 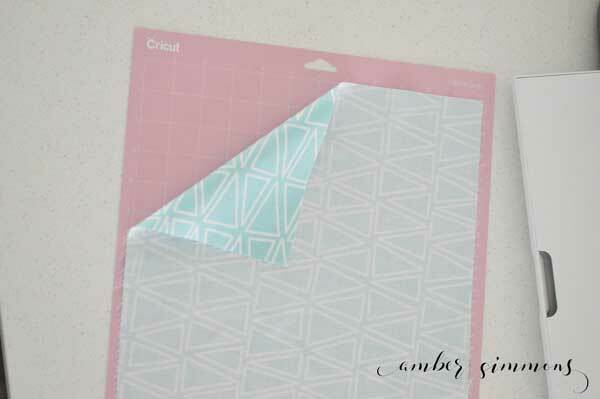 I used the triangle print from though Cricut Riley Blake Creative Rockstar line. 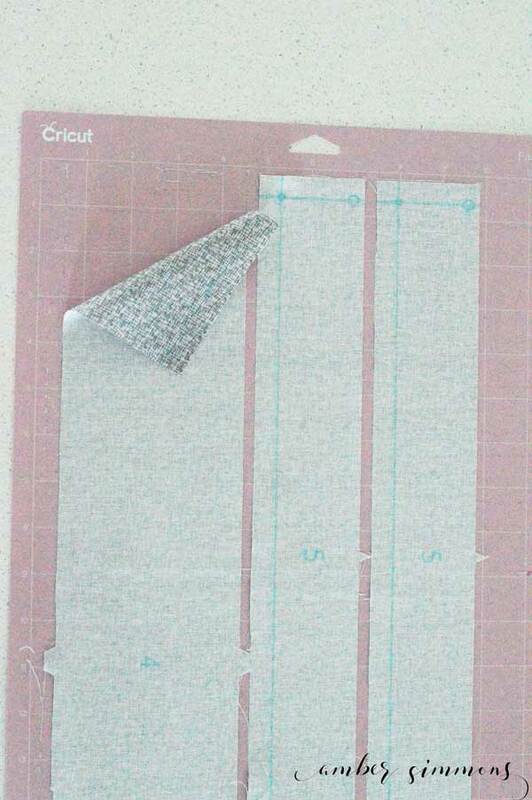 Place the fabric face down on the cutting mat. This will allow the marker to write on the back side. 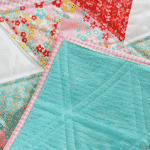 Choose the medium weight fabric for cutting cotton. Mats 3 and 4 are your interior. I used the gray fabric from the same pack. Again, lay it face down. Chose the medium weight fabric option again. Once everything is cut you can assemble. 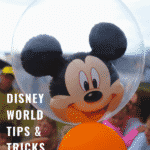 The assembly instructions can be found by scrolling to the bottom of the page and clicking the link to the PDF. I feel like the instructions were pretty straightforward but in case you are very beginner sewer I took a lot of pictures. Step one is to iron the top and the bottom of the front pocket half an inch. 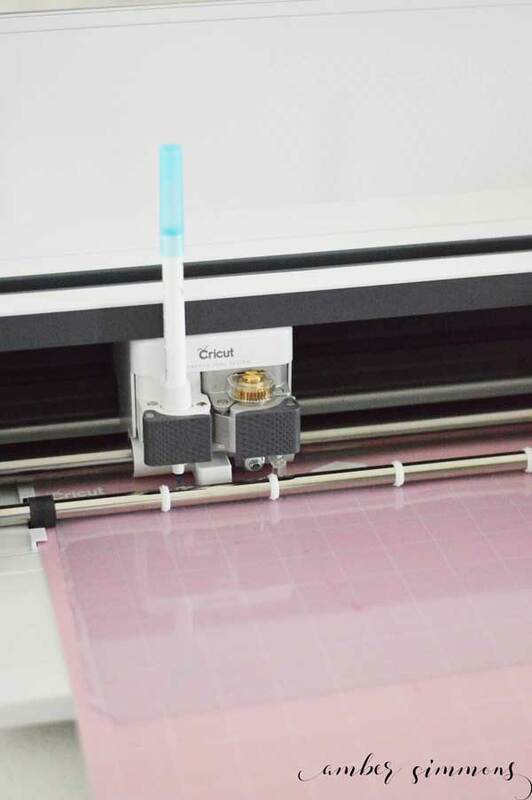 The Cricut Maker drew the line for you to fold on. I used to my Cricut EasyPress to iron the top. Do not actually use an iron on the bottom. It’s plastic and it will melt. 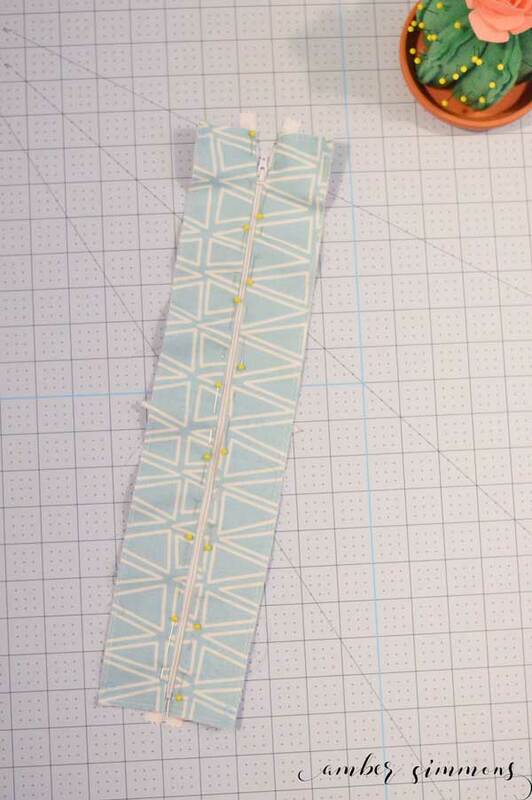 You just want to use your finger and press it down on the line that was drawn by the Cricut Maker. 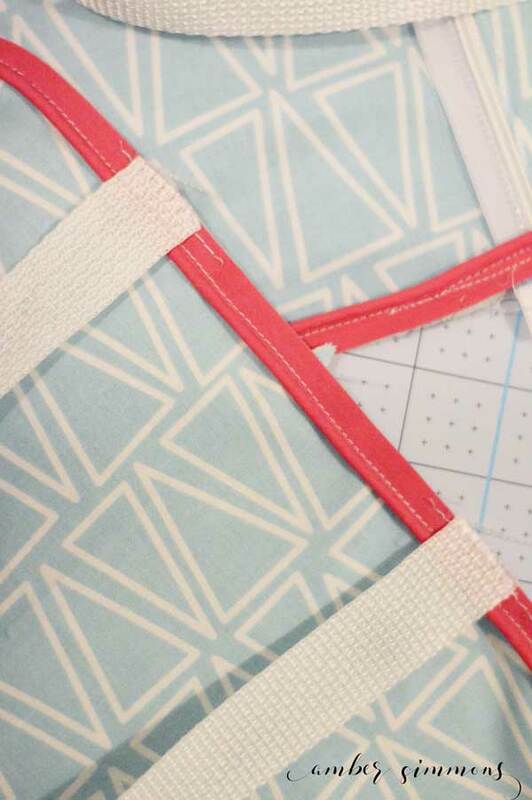 Then you’re going to pin the top as close as you can to the 11″ zipper. Don’t use pins in your plastic. If you use pins on the clear vinyl pocket it will poke holes that will not go away. 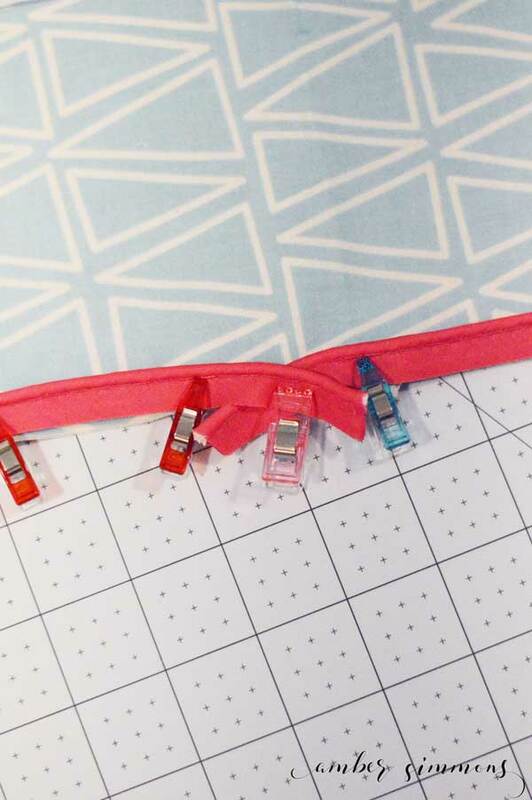 I like to use binding clips. Binding clips are my favorite. So you will see them a lot in this project. I love how easy they are to use. 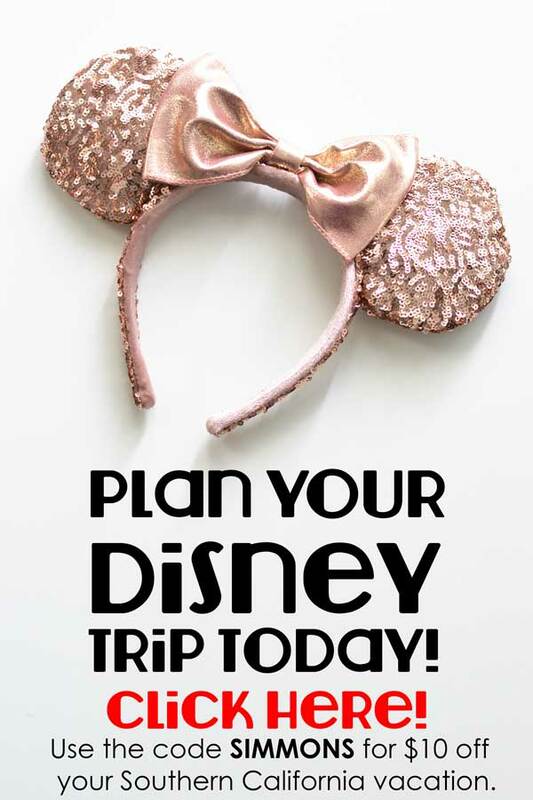 And how you can use them on any material. And how I don’t bleed. Does anyone else bleed every time they use pins? 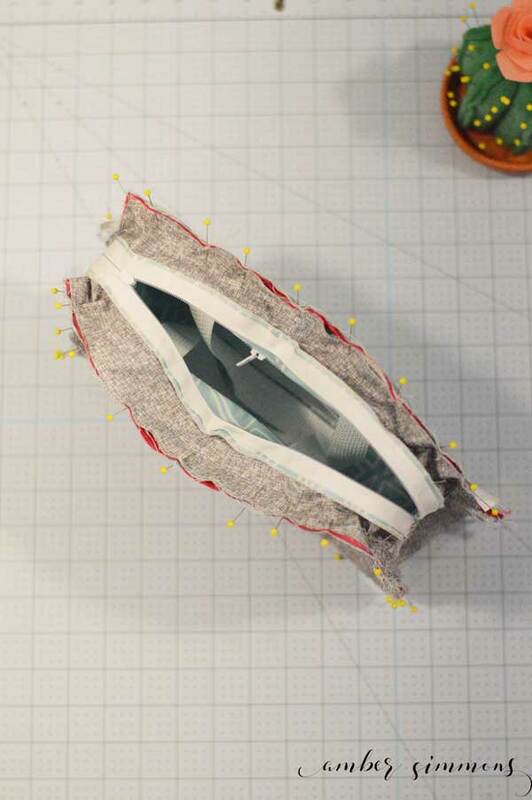 To sew the zipper you want to use your zipper foot. It’s the super skinny one. 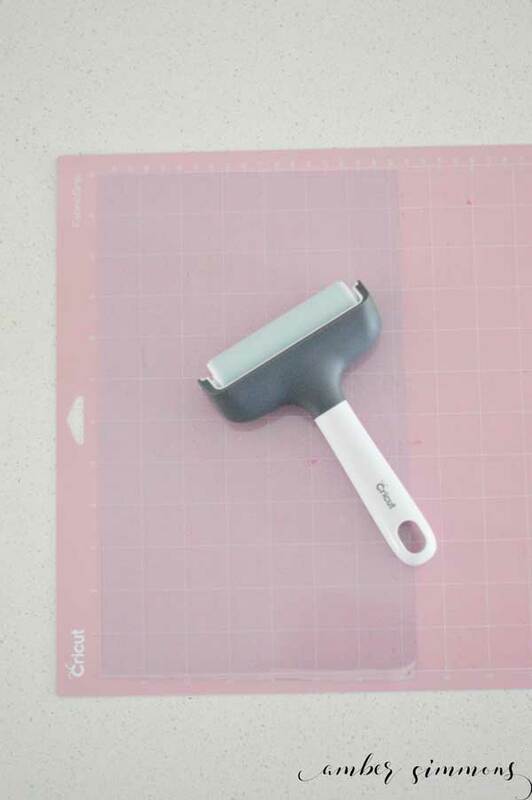 You’re going to stick as close as you can to the folded edge of your fabric. You want to leave a small space between your stitch and the fold, but have a really nice, close topstitch. I actually couldn’t find my zipper foot. Which was a huge bummer because I had to do this whole project with my regular foot. It is doable. It is trickier. So unless you have experience putting in zippers I wouldn’t recommend it. 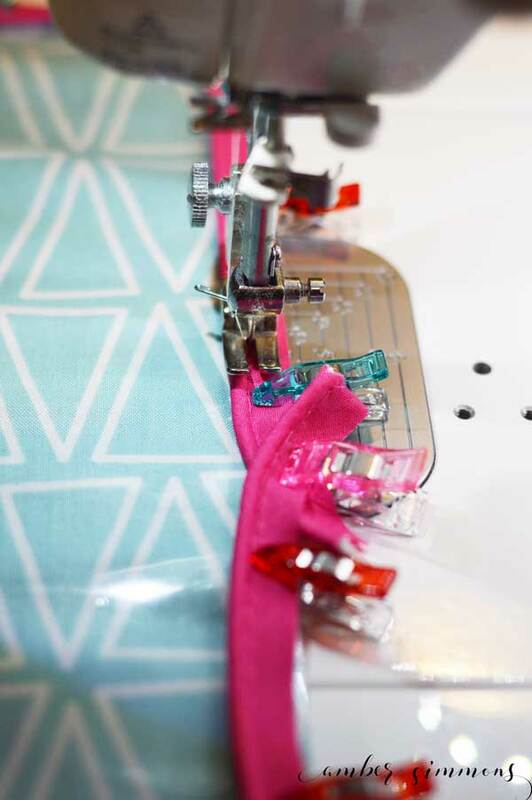 Next, you want to clip the vinyl in place along the edge of the zipper using the binding clips and top stitch down the folded edge of the vinyl. After this is done you’re going to put this front pocket on top of the front of your bag. 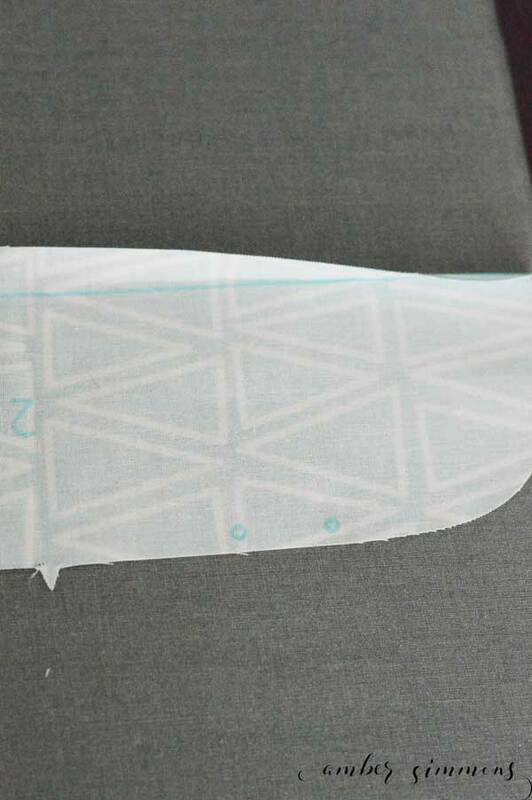 Then you take the interior of the front and place it wrong sides together on the back of the fabric. Clip/pin in place. 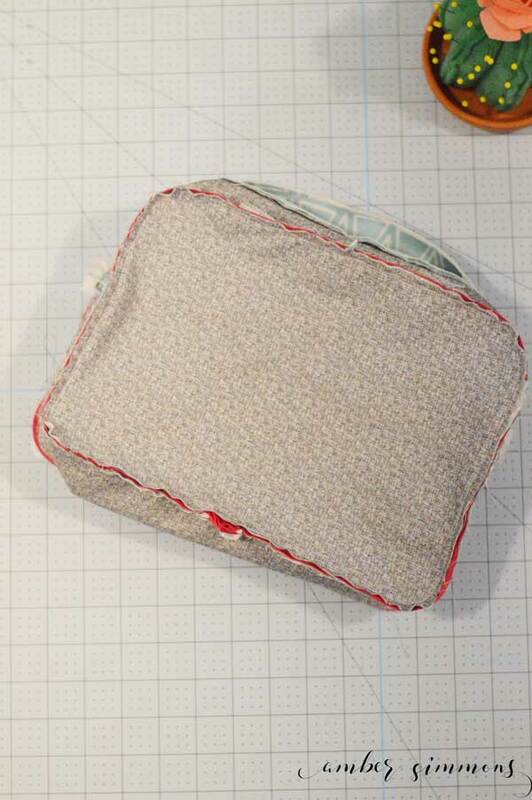 Take the outside and the inside of the back of your bag and place them wrong sides together and pin in place. Then pin your piping all the way around the outside of the front and back, starting at the bottom. 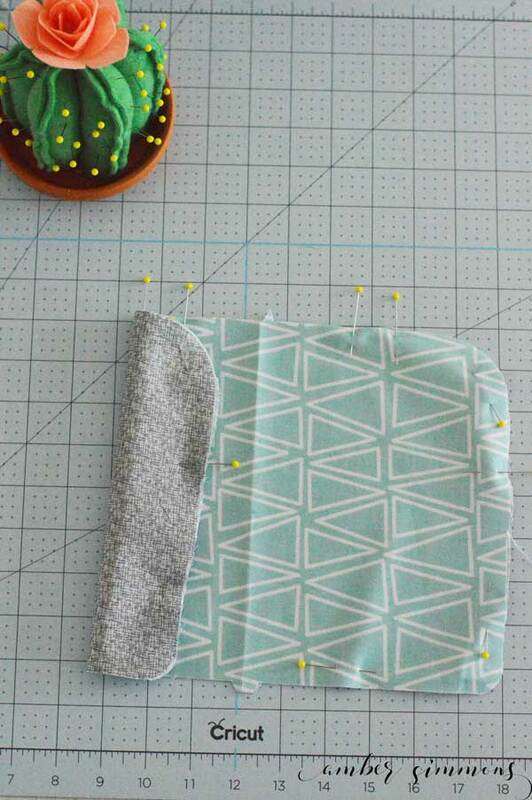 You’re going to put the puffy side toward the middle your project and the edge is going to go around the raw edge of your project. When you get back to the bottom overlaps them a little bit. Basically, when you add piping you want it to come on to your project at an angle go all the way around, overlap, and then run off. Then you’re going to sew around the edge of the piping. You want to get as close to the piping as you can. This should give you a nice quarter inch inseam. This works really great if you have a zipper foot. The zipper foot allows you to get nice and close to the piping. Be careful going around the corners. I broke a needle. So just go really slow. And if you need to you can stop with your needle in the fabric, lift up your presser foot, and turn your project. If the needle is up, you will lose your spot and end up with some wonky stitches. 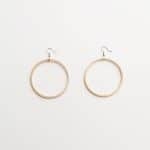 Now you’re going to take the webbing for your handles, cut them 18″ each, and you’re going to pin them between the dots so that they are outside your project. Make sure that they are not twisted. Do a basting stitch to hold them in place. 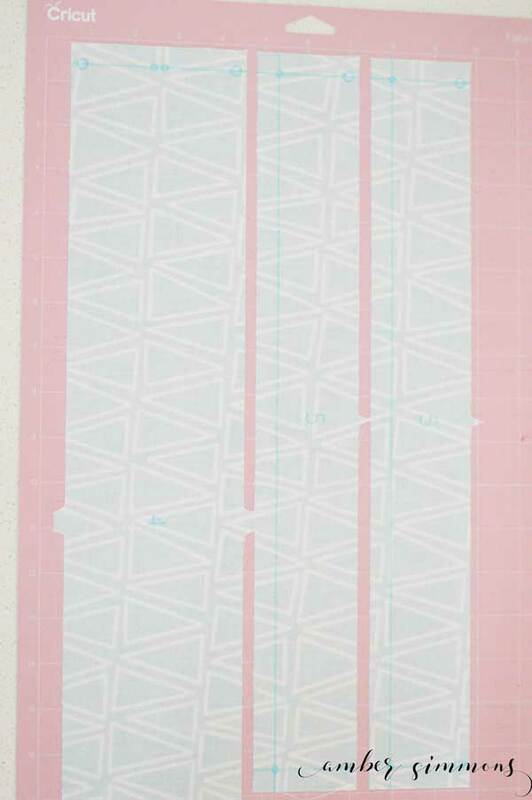 With wrong sites together you’re going to put the long side/bottom piece and the two top side pieces together, lining up the notches and dots. You will have three sections. The side and bottom come up and either side of the top zipper. Baste these pieces together. Be sure to change your sitch size back to regular length. 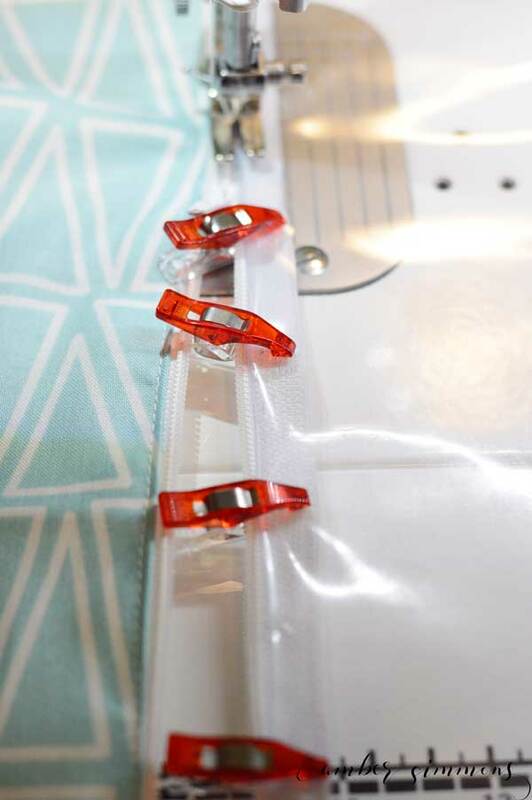 Now take the top two smaller pieces and press under half an inch, on the side without the notch, so that you can pin the folded edge as close as possible to the 16″ zipper. 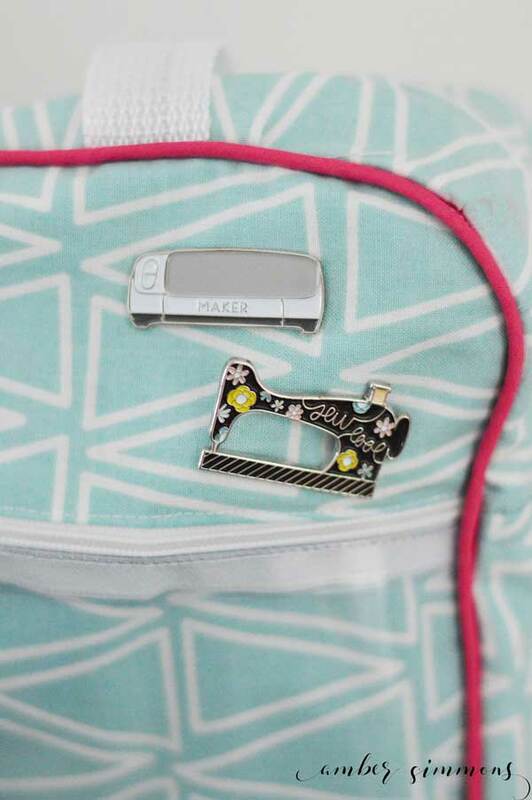 Again you’re going to topstitch closely to the folded edge on both sides of the zipper. Now you want to take the bottom and with right sides together stitch it to the top zipper piece, lining up the short sides on either end of the zipper. This will make a single circular piece. Once it’s stitched, you’re going to go down about a quarter of an inch from your stitching and top stitch from the outside. Now it’s time to assemble the entire bag. You’re going to carefully pin/clip the front and the back to the center of the bag. Be sure to line up the notches. 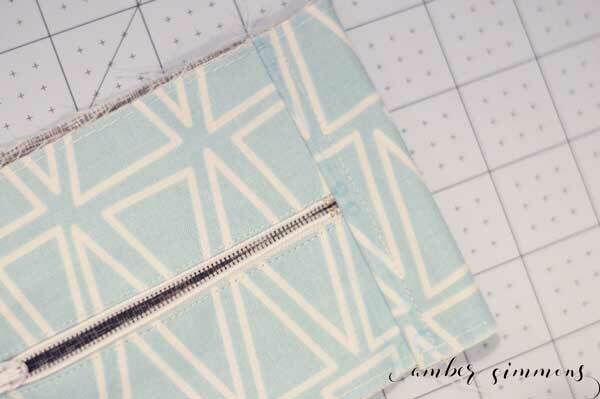 The front pocket zipper should also line up with the side seams on either end of the top zipper. You’re going to stitch around the edge on the front and the back. 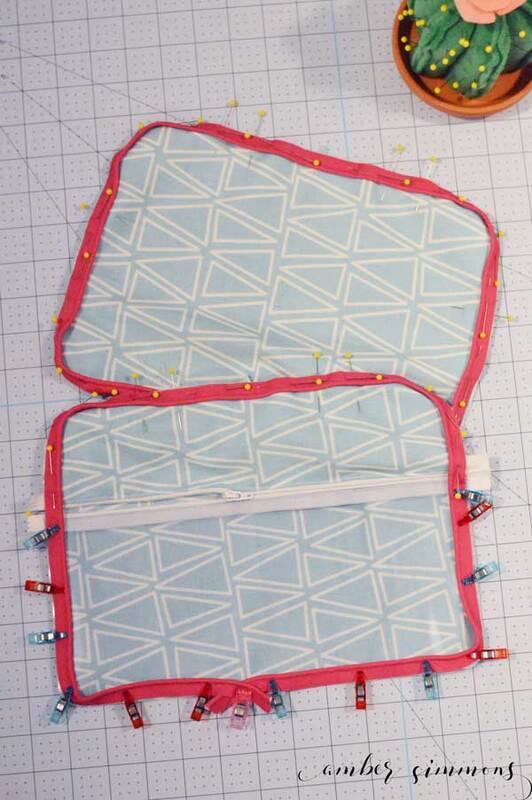 You can basically go over where you stitched the piping on previously. Remember, the closer you are to the piping the better. 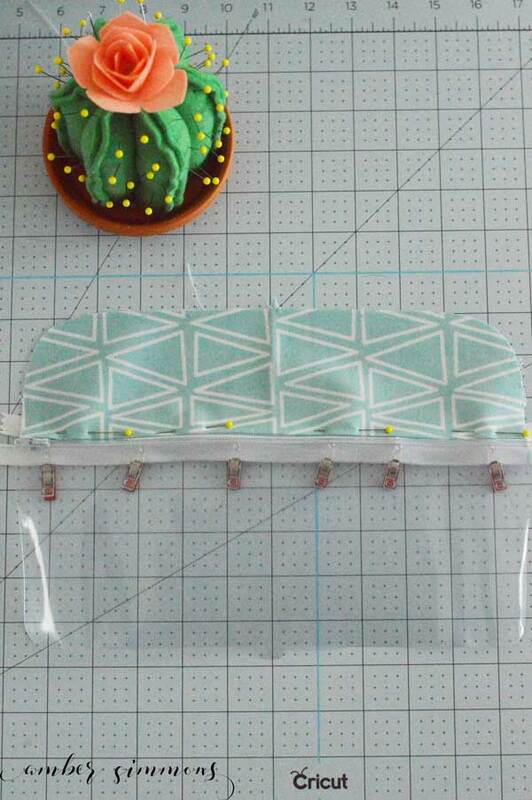 Once you have done this on the front and the back of the bag you take the bias tape and starting toward the bottom, but not in the same spot that your piping overlaps itself, you’re going to fold the bias tape over the raw edge so that there’s a nice clean finished edge inside your bag. Clip in place and topstitch down. If you start it where the piping overlaps it’s hard to finish it up right there as it’s a thick spot. Turn the bag right side out and your project is can completed. I think it turned out super cute. I really like it. And you can use that for a ton of different things. It doesn’t have to be used for makeup. 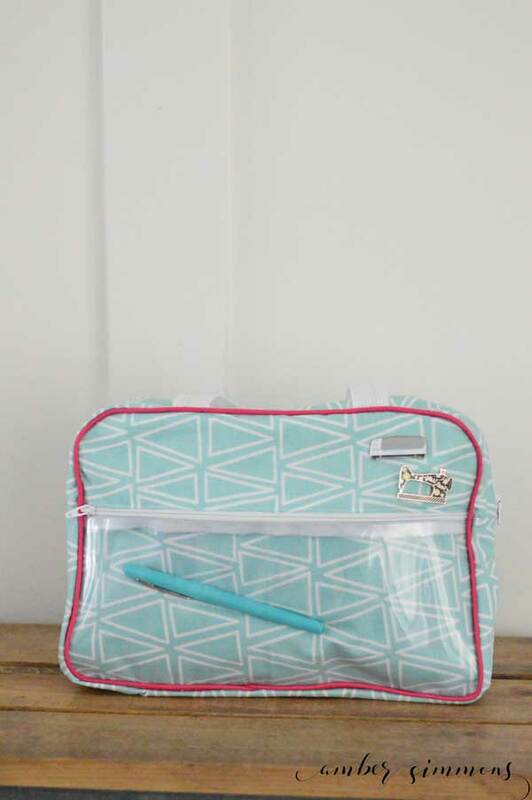 Even though the pattern says cosmetic bag. I added some cute Cricut pins that I got at the Cricut Mountain Make-a-thon last year. One of them is a Cricut Maker and one of them is a cute vintage style sewing machine that says “sew cool”. 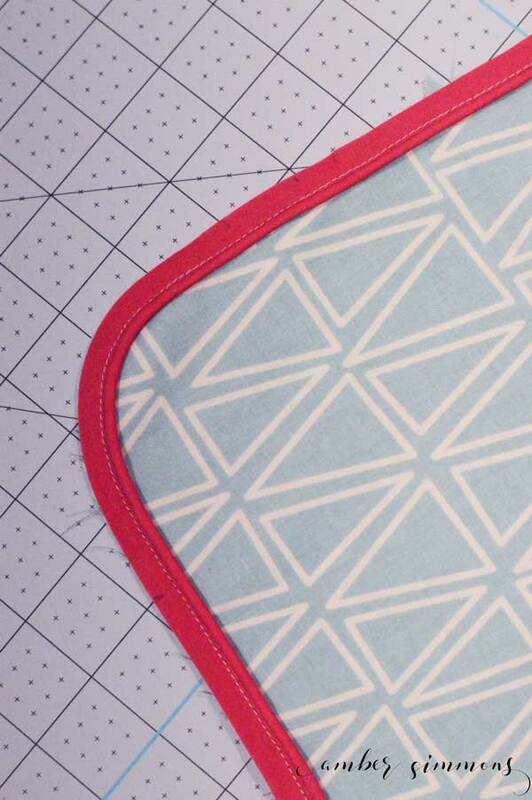 Have you tried making a sewing project with your Cricut Maker? What did you make? 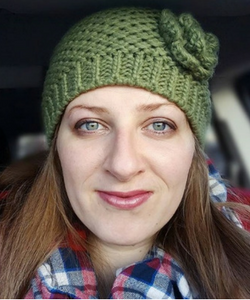 « What is Amazon Wardrobe?